This level has medium difficulty. 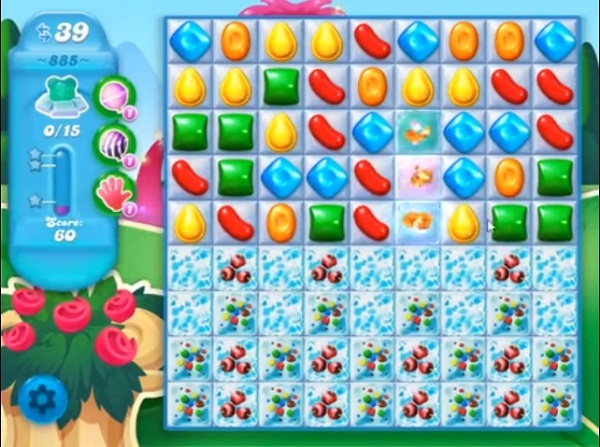 For this level try to play from top part of the board where more candies available to play and make special candy as you get the chance. Combine them with each other to break more snow blockers or play with remaining snow blockers to break them. BORING!!! can’t get much for matches, special candies or not, can’t come close without matches…. Okay, is this site some kind of joke? Medium difficulty?? The stupid game even says it’s hard. I get it that King is in this to make money but I consider paying to win the same as cheating and I don’t have money even if I wanted to buy stuff–which I don’t. I already have hundreds of “bonuses” or whatever all that crap is called. I hardly ever use because they do nothing. Guess it’s time to quit. Too much time spent on frustration and not fun. Hello? It’s a game; it’s programmed. Certain amount of luck and skill but mostly it’s programmed–to ruin your day, evidently.